We are so excited to celebrate our 45th anniversary and our second year at Linn County Expo Center on July 5-7, 2019. One of the challenges with moving to a new location for such a large event is coordinating dates with the new facility. Groups book dates years in advance, and the Gathering requires many days of setup to be ready for the three-day event. In 2019, this means that we'll all enjoy the Fourth of July weekend together! The Mid-Willamette Valley has so many events, and some great Fourth of July celebrations. Keep an eye on The Albany Visitors Association website for Fourth of July activities! We'll be back to our usual dates in June in 2020. Daily schedules will be available at the information booth, right inside the front doors of the Willamette Event Center, where many of the events like Sheep-to-Shawl, Fiber Arts Show, Demonstrations Workshops and Marketplace will be located. The Fleece Show and Sale and some of the workshops require a 5-minute stroll to the hotels or the Santiam Building just next door to the Willamette Event Center, so be prepared for a short, easy walk. Once again, we’ll have a huge selection of classes throughout the weekend. We welcome the Natural Colored Wool Growers National Show in 2019. You’ll be able to find some fabulous natural colored fleeces along with all the other sheep, mohair, and alpaca fleeces in the nationally renowned Fleece Show and Sale, located in the Santiam Building. The spacious and airy Cascade Livestock Barn will hold all of our sheep and goat exhibitors. And the alpacas will be located closer to the action between the sheep/goat barn and the herding demos in the Calapooia Arena. Be sure to stop by to see all of the beautiful wool-producing sheep, Angora goats and alpacas. Many of the producers have booths that highlight their products so you can buy local, straight from the farm. 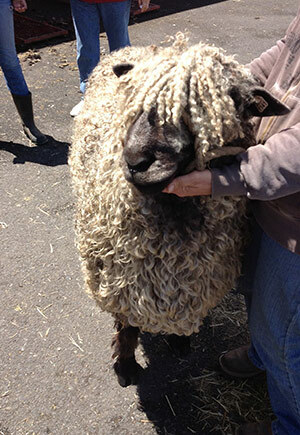 And Jake Valentine, known for his web-based live fleece auctions, will be providing shearing demos. Check out his Facebook Page. As usual, we'll have convenient camping and lodging options. We will be adding more food vendors this year too. It was wonderful to have the carts and the options for food, and the fairgrounds staff will be bringing in more for 2019. As always, admission and parking at the Gathering are free. Bring your families and friends and take part in one of the most unique events in the country celebrating natural-colored animals and their fiber. Please remember, no dogs, other than service dogs, are allowed, and Service Dogs are banned from the animal areas for the safety of the animals and participants. The Black Sheep Gathering is an all-volunteer organization that welcomes your suggestions, participation, and assistance. For information on specific events, to volunteer or to offer suggestions, please contact any of the committee workers listed on the next page. Here's a link to a story about the 2018 show in the Albany Democrat-Herald. It is with profound sadness that we announce the passing of our dear friend Wayne Thompson. Wayne peacefully passed away January 29, 2019, in his home with Rolly by his side. Wayne has been a treasured leader, committee member, and inspiration since we hosted the World Congress on Coloured Sheep in Eugene in 1989. Even after Rolly left the BSG committee, he continued to serve as our Vice President until the time of his death, and it is difficult to imagine a Black Sheep Gathering without his hard work, smiling face and easy going spirit. Rest peacefully Wayne, you will be sorely missed. Take part in one of the most unique events in the country celebrating natural colored animals and their fiber. If this is your first visit, welcome to our BSG family! MISSION STATEMENT: The Black Sheep Gathering is an annual event during which participants exchange their knowledge of an appreciation for handcraft fibers and the animals that produce them. GOALS: The Black Sheep Gathering strives to provide an environment dedicated to: education, cooperation and participation, an atmosphere of fellowship and fun, and celebrating natural colored animals and their fiber. 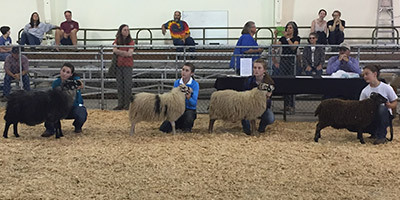 I currently raise both registered Natural Colored and Corriedale sheep on our central Indiana farm, having started with registered Corriedales as a 4-H youth in 1959.Read More. Clay has raised Angora goats since the early ’80s. His fine-haired Angoras have won championships at all the major shows in Texas. Read More. I am a 4th generation sheep and goat raiser from the Texas Hill country. My father was a state-winning sheep and goat vocational agricultural teacher. Read More. Michael Kelson started his fiber-arts journey when he learned to knit over 12 years ago. Read More. © - Black Sheep Gathering, Inc.